Articles from John Lister's regular column in the Morning Star, plus other articles for publication. HEALTH Campaigns Together, the biggest and most recent attempt to unite and mobilise a movement strong enough to challenge successive governments’ underfunding and undermining of England’s NHS since 2010, is a non-party initiative. 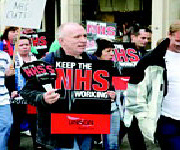 We have set out to work with health trade unions, local and national campaigns and with local communities and people of any party or none who are prepared to fight back in defence of proper funding of the NHS, against privatisation and fragmentation, and for properly funded, publicly provided social care. Our huge demonstration through London on March 4, estimated by police and the media at upwards of 200,000-strong, was backed by over a dozen national trade unions. It also brought along large contingents of people from rural areas and other parts of the country where the Tories have just strengthened their political grip in local elections — Devon, Lincolnshire, Oxfordshire and many more. We have insisted that the ambition of our campaign is to reach out even wider into local communities, building neighbourhood campaigns, linking them up and forging a movement that no government can ignore. To strengthen this we campaign on facts, not ideology. We collect, organise and publish the hard truth of what governments have done to our NHS since 2010 — most notably the seven years so far of near-frozen real-terms funding that aim to follow Labour’s decade of growth with a decade of unprecedented decline in spending as a share of GDP. Current plans would drop British health spending back to bottom of the league of comparable countries. The cuts in real-terms spending while the population and cost pressures increase have already led to cuts of 9,000 acute hospital beds (treating emergencies and waiting list patients) and 20 per cent of mental health beds since 2010. The shortage of beds plus brutal outright cuts in social care spending were key factors in last winter’s meltdown that hit the headlines in even the staunchest Tory media — with thousands of patients left waiting hours on trolleys for emergency admissions, a collapse against performance targets for waiting times in A&E, cancer treatment, and a leap in numbers waiting more than 18 weeks for operations. Now even the loyal Tory Daily Telegraph has flagged up leaked official NHS figures warning of a huge increase in the numbers waiting for treatment — from the current record 3.7 million to 5.5m by 2019 — with numbers waiting over 18 weeks expected to double to 800,000 unless extra resources are released. The Royal College of Surgeons says the growing waiting times are “unacceptably high” and warns that major brain and heart operations are among those likely to be affected by this worsening performance. But it’s set to get worse still. The mainstream media has eventually noticed that many of the 44 Sustainability and Transformation Plans (STPs) signed off by NHS England seek to downgrade hospitals or A&E units, cut bed numbers and reduce numbers of patients treated — as each of them seeks drastic “savings” to bridge an expected £22 billion gap between resources and needs by 2020. In many rural areas the planned “reconfiguration” of hospital care could mean journeys of up to 50 miles to access “local” hospital care. All of these hard facts are potential dynamite for Theresa May, since many of the people most seriously affected by the NHS and social care cutbacks will inevitably be Tory voters. But there’s more: the hidden Tory agenda since 2010 has been kept out of the public eye because it is divisive among their own ranks: most Tories value and use their local NHS services, and are angered by suggestions that local A&E units should close. Nonetheless if they vote for May’s “strong and stable” government, it will be taken as a green light to press ahead with even more controversial cuts and closures. Most Tories are against privatisation of the NHS. But they had as little say as the rest of the country over Andrew Lansley’s Health and Social Care Act, which was not in the manifesto, and only unveiled after David Cameron fought the election pledging no more top-down reorganisation of the NHS. The Act has brought even more fragmentation, bureaucracy and chaos to the NHS and was designed to open up more possibilities of handing contracts to private-sector providers. Indeed even during the pre-election “purdah” period, management at the Royal Liverpool Hospital have been emailing consultants to announce plans to increase the income from private patients and inviting consultants to help this along: this will not be a unique example. Behind the scenes, while ministers proclaim their love of the NHS, the private sector has been growing on the strength of public funds. The proportion of NHS spending on clinical care from private providers has risen steadily since 2010, while the finances of the NHS providers have been undermined. Across England on average £1 in every £8 of local commissioners’ budgets is now spent on care provided by non-NHS organisations, and almost half of the additional £2bn of funding for the NHS commissioning budget in England in 2015-16 was spent on care provided by non-NHS providers. Private hospital chains have been the big winners from this, coining in increased profits from treating NHS patients for whom there is no longer enough bed space as hospitals are reduced to an emergencies and chronic care service, allowing the private sector to cherry-pick the potentially profitable contracts for the least complex elective care. As delays in treatment increase and the waiting list lengthens, more impatient patients can also be expected to dig into savings or borrow money to pay for quicker private treatment, while cash-saving plans in many clinical commissioning groups now look to restricting the range of treatments that are available as elective care — forcing more people to go private or go without. So how have things got so bad with so little overt opposition? How have Cameron and May been able to keep the real NHS policy so well concealed behind a bland rhetoric and cynical assurances? Labour from 2010 has to take much of the blame — for lacklustre, belated and limited opposition to the spending freeze and even the Health and Social Care Act under the coalition from 2010, partly because of a refusal of the Blairite wing of the party to allow a critical view of the party’s own record in government. It was after all Blair’s government which chose to waste billions of the extra funding it pumped in to the NHS on deepening what Blair himself had called the “costly and wasteful” purchaser-provider split of Margaret Thatcher’s “internal market” and making it a real market by opening up contracts for clinical services to private providers for the first time. It was Blair’s government which signed the first extravagant and increasingly unaffordable PFI contracts to finance new hospitals through annually increasing payments over 30 years, pumping a growing profit stream into the coffers of banks and finance houses, many of them now offshore. The grim legacy of these historic blunders is now visible in many areas: and even after Jeremy Corbyn took over from Ed Miliband in the autumn of 2015 it has taken too long for Labour to get to grips with these issues and develop a more credible policy. But at last there are signs that it is being done. In a landmark speech to Unison health conference, shadow health secretary Jon Ashworth made an important series of commitments that give those wanting to stop the Tory assault something positive to vote for rather than just an anti-Tory vote. He went on to commit to invest in the NHS to hit A&E targets, to “deliver long overdue improvements to underfunded, understaffed” mental health services. Labour is also now pledged to remove the cap limiting NHS pay increases, reinstate NHS bursaries, guarantee the security of EU and other staff working in the NHS after Brexit, and to bring in a new law to enforce safe staffing levels. In separate statements on funding, shadow chancellor John McDonnell has made clear that Labour would increase investment in the NHS, although the party has yet to commit calls from NHS Providers for an extra £25bn by 2020 (£15bn over three years in revenue plus £10bn capital) or the Institute of Healthcare Management’s call for three years of £8bn increases. There’s plenty of room still for improvement but at last the Labour leadership has established a clear alternative and set themselves out as the only party committed to bold moves to repair and improve our damaged NHS. Theresa May has made clear she does not want the NHS to be central to debates running up to the election: but her whole stance since becoming Prime Minister makes clear that a vote for “strong and stable” leadership would be taken as endorsement for five more years of cuts, closures and privatisation — regardless of local views. The polls look grim: but if Labour can keep on the pressure, this still could be an election where people wake up to the need to vote for the NHS. Don’t take any chances with your health: #voteNHS. This might be the last chance to stop the rot before our NHS declines into persistent crisis and chaos, with the private sector waiting in the wings. 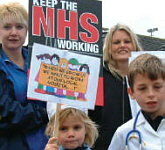 * Health Campaigns Together (www.healthcampaignstogether.com) has published a fact-filled election special broadsheet that backs no party, but makes clear the view that voters should only support candidates committed to fighting on after June 8 to defend local access to services, against cuts and privatisation. * This article was first published in the Morning Star, May 11.